Kapamilya actor Coco Martin shaved his head as part of his role in the upcoming ABS-CBN's teleserye adaptation of Fernando Poe, Jr 1997 action film "Ang Probinsyano." the late action star starred in the movie that had been greatly accepted by nationwide audience. 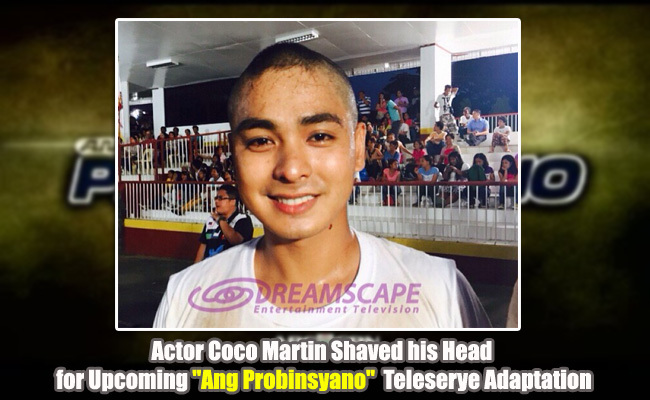 Dreamscape Entertainment Television, producer of the teleserye, had released the photos on Instagram showing Coco Martin’s head being shaved. Other photos showed the actor with his co-stars including the veteran actress and Fernando Poe, Jr’s widow, Susan Roces. The scene showed in the photos was taken at Philippine National Police Academy in Cavite. The ‘Ang Probinsyano" portrays a story of a provincial cop named Kardo. In the 1997 film, Kardo assumed the identity of his twin brother who died during the drug bust operation. In an interview with TV Patrol, some police officers said that the TV series is a good way to show people the good side of the police department. Together with Coco Martin are Angeline Quinto ad Bella Padilla.